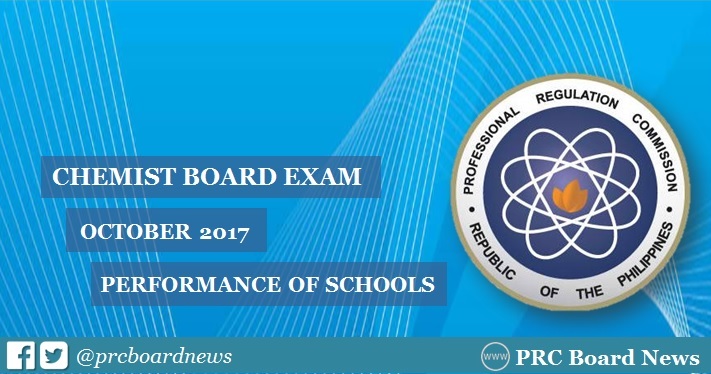 MANILA, Philippines - The Professional Regulation Commission (PRC) recognizes the top performing schools in the October 2017 Chemist board exam. The result was officially released on Wednesday, October 18, 2017 or in two (2) working days after the exam. University of the Philippines - Diliman (UPD) led the schools with 87.93% or 51 out of 58 passed the exams. UP - Los Baños (UPLB) got the second spot with 86.67% or 52 out of 60 passed. In the October 2016 Chemist board exams, University of the Philippines - Diliman (UPD) topped the schools with 95% passing rate or 57 out of 60 passed the tests. UP-Los Baños ranked second with 87.72% or 50 out of 57 successfully hurdled the exams. In the September 2015 exams, UPD was the lone top performing school with 95.65% or 66 out of 69 passed.